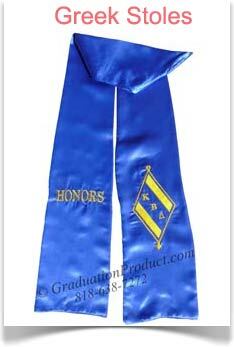 ﻿ Order personalized stoles & fraternity graduation sashes,wholesale custom graduation stoles online from our store. Plain graduation stoles are available as low as @ $3.99. 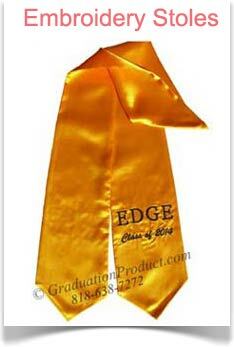 One Side Embroidery graduation stoles are available as low as @ $4.99. 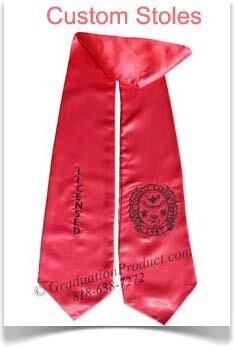 Two Side Embroidery graduation stoles are available as low as @$5.99. Greek graduation stoles are available as low as @$5.99. 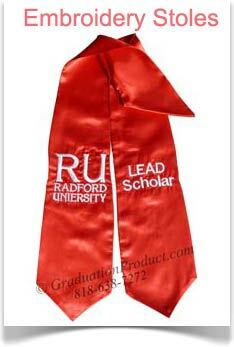 Logo graduation stoles are available as low as @$8.99. Custom graduation stole are available as low as @ $4.99. Buy custom stoles , one side embroidery stoles , two side embroidery stoles from store. We make custom stoles that you design We make a online custom stoles making tool that helps you in creating custom stoles. You change embroidery text, Stole color , Upload logos , Choose greek letters and much more from this tool. Buy Greek Graduation stoles from our store. Greek stoles prices are as low as $5.99 . 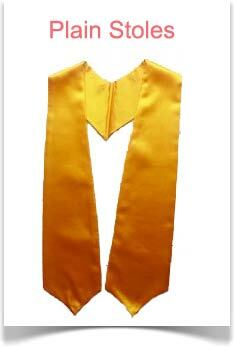 We offer a full line of ceremonial and graduation Stoles,fraternity graduation stoles & Sashes ,personalized grad sashes,other celebratory items. Graduation Stoles and Sashes for Schools & Colleges. We supplies graduation sashes & graduation stoles for graduates to wear as a keepsake on graduation day. Order your custom graduation stole now. Fast Shipping. Plain Stoles available in more then 30 colors. All Plain Stoles orders are Delivered within 2-3 days from Order. Order Now ! Stole Details 61" Long All Together30.5" Long On Each Side5" Bottom Width Front Ends In Point Contours To Body Stole Fabric Light weight Polyester Shiny Satin Machine Woven 155 GSM Rich In Color. Be it to add your special touch to your home/restaurant/boat or party time to let your hair down. Do it in style! Variety of orders to choose from. Short lead time, quick & efficient deliveries. What could you be waiting for! Discount Pricing is available to all genuine importers, chain stores, & wholesalers for orders above $2000 Give us an idea of what sort of QUANTITIES you are looking to import per item and your TARGET PRICE. We just need a general idea, and we will send you our Wholesale F.O.B prices. We will match your price. All our Products are made in-house and can be custom made as per your specifications. Wholesale graduation sashes. Click under each item (add to cart button) to place a tentative order. Special colors and sizes can be added in the special instructions box at the bottom of the final order page. We will email you a confirming order within 24hrs, usally with photographs of each item ordered. Minimum quantity is first shown by default per product when you click add to cart, you can increase it according to your requirements. All orders are shipped from India andusually take a week for manufacturing, and 2-3 working days in transit through DHL, FedEx to USA Products that are kept in stock are shipped same day and takes 3 business days to deliver. If you use a particular item often , let us know and we can hold some stock for your future orders. Our web-site is the only form of catalogue that we have available. We encourage designers and fabricators to customize our products to meet their project requirements. Our staff values the individual character of design and will always work with a project coordinator one-on-one when custom fabrication is required.